On this sunny/raining/warm/cool/overcast day the MCGC returned to Massey Park. Ben France dogged ‘The But’ morning tea to defend his title against 7 other students and the first appearance of a lecturer (Gibbo, I hope you got back in time for you NT marking meeting ;-)). 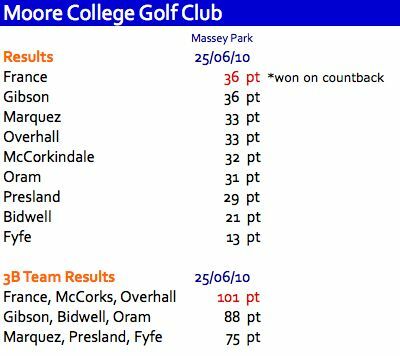 The aforementioned lecturer tore up the coarse early with two birdies on the front nine (we won’t mention the 10 on the 4th hole) and Oram, Presland and Marquez shot to their handicaps or better on the back nine. However, there was no stopping the defending champ from reclaiming his trophy. 13 points in the last 4 holes led him to shoot 36 and beat Gibbo on a count-back. 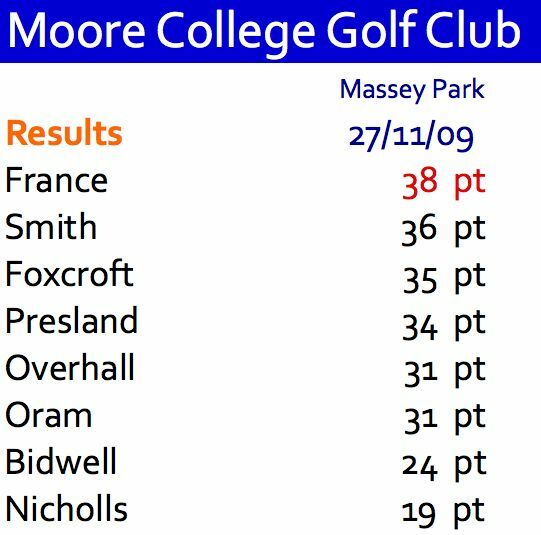 Other highlights included all groups completing their rounds before it got dark, Francey’s haul of golf balls he fished out of the canal and the mutual consensus to raise Bidwell’s handicap artificially before the next round following today’s performance. Here are the singles results and the handicaps for next round. Previously Tiger Woods is 14 from 14 wins in major titles when he had the lead in a major championship. But it wasn’t Harrington, Mickelson or Els who broke the trend but South Korean Y. E. Yang. He becomes the first Asian-born male to win a golf major. Woods made mistakes, but kept the pressure on, but Yang held firm. His round included a chip-in eagle on the 14th and a glorious fairway metal to 10 feet on the last to sink Tiger’s hopes (see these shots here). Maybe it’s my Aussie nature but I love it when the underdog wins, as much as I admire Tiger as a player. A couple of cool things: 1) No having foxtel, I could still follow the golf on twitter; 2) I’m posting this news before smh or cnn websites! The MCGC moved to Massey Park for its second round following our New Testament exam. Under sunny skies, Oram and Overhall tore up the course, but it was ‘the power of Pass’* that prevailed. Bruce, in his return to golf since leaving Germany used is classic(al) swing and metronomic tempo to win by 4 points. Squishy grounds, ladies’ clubs and darkness setting in couldn’t stop Bruce’s consistency. The teams’ event went down to a count back with Overhall, Fyfe and Nick (Darcy) Moll taking the win. Best dressed was narrowly taken out by Snowy. Photos, results and handicap calculations are below.